SUBANG JAYA: Even before its launch, Proton's latest Inspira sedan has been the subject of controversy with some quarters accusing the national car maker of back pedaling towards the early Proton days of rebadging Mitsubishi models as its own. At a special media briefing held at Proton's Centre of Excellence recently, Inspira's project manager Zulkifli Bidin clarified several matters. He said the Waja's replacement model originally started out as a joint development project between Proton and Mitsubishi Motors Corp three years ago. "Under the project, Mitsubishi and Proton were to use their own upper body designs, which would result in two very distinctive models. 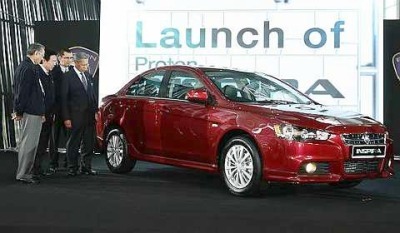 "But because of the economic downturn, Proton decided to defer the project but Mitsubishi carried on with the platform and upper body development which became the Mitsubishi Lancer," he said. Rather than restart the project from scratch, Proton decided to use the Lancer as a new starting point while adding value to an already good design. Rolling out: International Trade and Industry Minister Datuk Seri Mustapa Mohamed (right) looking at the new Inspira with (from left) Proton's advisor Tun Dr Mahathir Mohamad, Proton Holdings chairman Datuk Seri Nadzmi Mohd Salleh and Proton Holdings group managing director Datuk Syed Zainal Abidin Syed Mohamed Tahir after the launch at the Proton centre of excellence in Shah Alam. Zulkifli said Mitsubishi was willing to allow Proton to rebadge the Lancer as the Inspira without changing any key features. "We felt that our engineers who had trained under our subsidiary, Lotus Engineering, were able to improve the driving dynamics and handling of the Lancer," he said. After convincing Mitsubishi that Proton could improve on Lancer's driving performance, Mitsubishi gave the green light to the suspension tweaking. Among the improvements were revised suspension rating and bushings for a more comfortable ride and the incorporation of thicker anti-roll bars for better cornering stability. Other improvement work include closer body gaps of 2.5mm compared with 3mm in the Lancer, and reduced levels of noise, vibration and harshness. "Even when our products are good, people will still say they are not good enough because we are Proton. So, we have to be better,"
Proton had shipped five Inspira sedans produced by its factory for crash-testing in Japan to ascertain its crash worthiness and safety features. "At our Shah Alam factory production lines, Mitsubishi has stationed its engineers to ensure that the Inspira is produced in accordance with Mitsubishi's quality standards," he said. Even Mitsubishi Motors Corp's top management team, consisting of its head of research and development, DCGM of Asean and master vehicle evaluator who came to Shah Alam to test the Inspira, have praised Proton for work done on returning the suspension system for better comfort and handling.